People fear and even hate disabled people because we remind them that they are both fragile and mortal. They don’t want to remember those things about themselves. And they find ways to physically shut us away, and mentally shut us out of their awareness. And they delude themselves that they are different. That something they do will prevent them from ever becoming one of us. And prevent them from ever dying. I have lived a long time as what I’d call precariously ill. A person who’s precariously ill isn’t terminally ill. There’s no saying for sure that we’ll die of our illness. But death is a constant possibility. In my case, my gastroparesis led me to frequently inhale large amounts of stomach fluid at once. I have bronchiectasis, which makes it easy to get infections and hard to clear them. 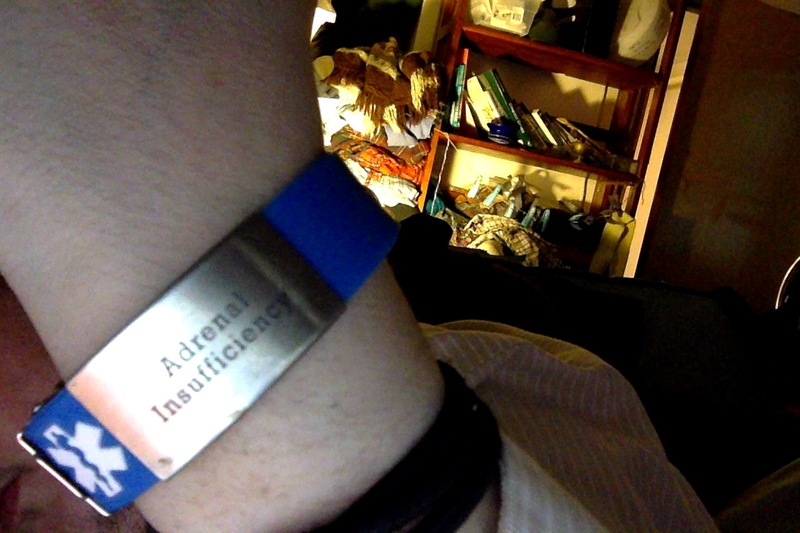 And untreated, severe adrenal insufficiency, which can turn an ordinary infection into an adrenal crisis. That combination made my health, and my life, very precarious indeed. I have a strong belief that if people were more open about death, people would be less terrified of their own mortality. And thus less terrified of things that remind them of their mortality. Like, say, disabled people and sick people. I’ve never had what they call a “Near Death Experience” ™ where you come very close to death and have this fairly uniform experience of a light at the end of a tunnel and all that kind of thing. But I’ve had encounters where I’ve gotten too close to death for comfort. Usually I had an infection that wasn’t playing well with my untreated adrenal problems. I would become extremely weak, so tired that it felt like just keeping my heart running and my basic bodily functions going, was too much. and I was losing the ability to do those background things your body is supposed to do effortlessly. And then I’d see death hanging around, it’s the only way I know how to put it. Sometimes other people around me would see it too. A light would fill the room. It wasn’t a visible light. It was something I’d see on the inside of my head. It seemed to be coming from everywhere. There was a sense of being more profoundly at home than I had ever been in my life. As if there was this one tiny piece of the universe where I fundamentally belonged, and I had finally found it. There was an overwhelming sense of benevolence and peace. And there was the sense that if I wanted to, all I had to do was relax and stop fighting. All I had to do was rest. And I could be in that intense, profound place of love forever. But if I fought, and won, it would still be waiting for me when my time had come. It did not entirely urge me either way. It was patient. It had all the time in the world. But while it didn’t actively urge me to die, death did have a gravitational field. That’s what I called it during my first conscious encounter with it. I was ashamed, at first, to tell my friends what it had felt like. I was afraid they’d think I was weak, or cowardly, or that I had a death wish. So with some disquiet, I told my friend what it had felt like the first time I encountered death in this manner. It felt, at first, like I couldn’t fight. More than that, I didn’t want to. I couldn’t even conceive of fighting. I had a strong urge just to rest. To allow my heart to stop and my breathing to slow and to surrender myself completely to death. The closer I was to death, the stronger this feeling was. So I started referring to it as a gravitational pull. It was only when I gained a lot of strength back due to medical treatment that I even had the will to resist, let alone the power. My friend gave me an explanation that made me feel much better about my reactions. It was not that I was weak-willed or wanted to die. It was entropy at work. Entropy involves a system trying to go to the lowest energy state. In order to survive, living things are constantly fighting entropy. We do this by feeding off of other living things and converting it into fuel to give us the continued energy to survive. If we simply allowed ourselves to go to the lowest energy state without a fight, we’d be dropping dead right and left. Most of the time, we are good enough at temporarily cheating entropy that we don’t feel its pull on us. But when we are severely ill enough that death is a possibility, then we begin to feel it. We feel how strenuous it is to stay alive. And if we are sick enough, and exhausted enough, we begin to feel an overwhelming desire to allow ourselves to go to that ultimate rest. To allow our bodies to wind down forever. And that is the gravitational pull we have to escape if we are to live. Much like a black hole has a point of no return, death has an event horizon too. I’ve obviously never been past it. But I’ve seen people and animals who have. And I saw (in my head, not with my eyes) that same intense light around them, that seemed to come from everywhere and nowhere at once. I felt that same profound, unconditional love. This is how I know that death is nothing to be feared. In fact, even though the separation between us and our loved ones can cause tremendous pain and grief, death itself can be a beautiful process for the person who is dying. It can be for those around them, too, if everyone lets it be what it is. I want to emphasize something though. Yes, I believe that death can be benevolent, friendly, necessary, and even beautiful. But I also believe all those things about life. And given that we only get one shot at this lifetime (even if reincarnation exists, which I don’t pretend to know) then it’s very important to resist death until it’s actually our time to die. Our life is something we owe not only ourselves, but the people and society around us. Whether or not we understand our contributions, we each have one, and the world loses something without each of us in it. Disabled people in particular get a lot of messages saying that we are burdens on society, that we do not contribute, and that it’s best if we’re dead. And that’s completely wrong. In fact it’s despicable, unforgivable, to do anything to convince someone that these things are true of them. One thing that facing death can do, is force you to reexamine your priorities in life. And that can be scary. It can be especially scary if there’s something in your life that you’ve been running from, hard, for a long time. As you near death, you won’t be able to keep up the fences in your mind that allow you to deny things like that. If you learn to face these things long before you get close to death, then death is less scary. And if there’s something you’ve done wrong that’s been a burden on your mind, it can be important to remove that burden before you die. That’s why some religions practice confession before death, but it doesn’t have to be in a religious context if you’re not religious. But the sooner you deal with things like this, the less they’ll hang around and make your death unpleasant. Love is all that’s important. The experience of love, the expression of love, living love and compassion as your highest and only principles in life. Living for what you can do for others, not what you can do for yourself alone. Everything else fades into the background. I can remember an ambulance ride after aspirating stomach fluid. When that happens, you don’t know how long you’ll survive. You could get an infection and get over it, or it could do you in within a week. You don’t know if you’ll get lucky, at that point. And everything narrows down. At that point, I always find myself faced with one question: “Have I loved enough, and have I expressed that love enough throughout my life?” Everything else falls away. That’s the only thing my conscience cares about in the end. Have you lived your life as a strong enough expression of compassion and love? The best way to have few regrets when you die is to get started living that love right now. Easier said than done, but worth the struggle. This doesn’t mean becoming touchy feely and hugging everyone you meet. It doesn’t mean being serene and peaceful all the time, or never getting mad. (In fact anger is sometimes — sometimes — an expression of love at a particular moment. Not habitual anger problems, but anger as a reaction in a particular situation when everything fits together in a way that requires it.) Love is an active thing that requires constant evaluation and action. It’s not holding hands and singing kumbaya. It’s not feeling soft and fuzzy all the time. Expressing real love can be fierce and intense, difficult and demanding, even scary sometimes. But if you want to have as few regrets as possible at the time of your death, it’s best not to wait: Get started living a loving life right now. And start facing things you’re trying to run from. And unburden your conscience from anything that’s been weighing on it. Because you don’t want to die terrified, fighting against yourself, feeling the pressure of unrelenting guilt or shame. It’s best to live your life now in a way that will leave you with no regrets when you die. But that’s a hard thing to do. I’m aware of this stuff, but I can’t claim to be living the perfectly loving life that I want to be living. I know there are things I could be doing for others, right now, that I desperately want to do for others, that somehow never get done. Despite that, I know deep down in my bones that love is the only way to live a good life or die a good death. It’s hard for even disabled people to talk about what a good death looks like, because we are under so much pressure from society to accept that death is better than disability, that death is an acceptable alternative to the unbearable suffering that we are supposedly enduring, that we will be happier dead than alive. The media is full of stories where nondisabled people kill us and we’re said to be better off, our deaths are said to be understandable. And stories where we become suicidal and instead of trying to prevent our suicides, our societies rally behind us to give us a ‘right’ to an easy death. That stuff is everywhere, and it makes it very hard for us to look at what a good death would actually be. It’s especially hard to talk about accepting death, because people are always pressuring us to accept our deaths long before we are ready to die. I would quite possibly be dead already if I hadn’t had a lot of the online disability community fighting for me last year, when doctors tried to persuade me not to get a feeding tube. (They couldn’t deny it outright, because they knew I needed one. So they came into my hospital room every day while I was sick and weak and exhausted from pneumonia, and tried to persuade me that life with a feeding tube was so awful that ‘the alternative’ would be preferable.) I clearly disagreed with their assessment of when is the right time to die, and I disagree with anyone who tries to make it sound as if living with a feeding tube, on a ventilator, or with other ‘artificial’ means of living, is somehow the point at which disabled people should give up and die. But there is a point when giving in isn’t a bad thing. And it’s not a matter of how many machines you’re on to keep you alive. It’s not a thing that can be quantified. It’s that nebulous time “when your time has really come”. At that point, there’s no shame in giving up the fight, because fighting when you’re truly beyond death’s event horizon just makes death more unpleasant, it doesn’t keep you alive. But I’m afraid to even say this, because I know someone, somewhere, will twist it around and use it to persuade disabled people to give up and die before our time is really up. It happens all the time, and disabled people have every right to be extremely wary of talk of ‘giving in’ as a good thing. But regardless of that, death still has an event horizon. And once you know, for sure, that you’re beyond that point of no return, then there is nothing wrong with simply surrendering to love, surrendering to the light, surrendering to whatever gods you do or don’t worship, whatever you want to call it, however you see it. And you will become part of the rest of the world, and that is right, and true, and beautiful. And heartbreaking for those you leave behind. Between my experiences lately, and serious medical experiences my parents have been having, I’ve been thinking a lot about death. But now, I’m writing about a different aspect of ableism and death: The way ableism against disabled people is tied to nondisabled people’s fear of sickness and death and physical imperfection, fear of their own mortality. And dismantling fear of death dismantles that aspect of ableism. Nothing I say here should be taken as supporting ableist ideas about how disabled people should just accept our deaths and go quietly. Instead, I’m talking about a more universal acceptance of death, one that should happen when our time has truly come and not before. And I’m talking about love, because I deeply believe, more deeply than ever, that love is the only thing that can make things right in the world. Love that comes from the depths of what it is to be a person, love that comes from everything good in the world, love that demands a lot of us and changes us and is intense and powerful and fierce and real and sometimes demanding and scary. Love that leads to compassion that leads to actions people undertake for each other, not for ourselves. And most of my sense of this love comes from my encounters with death. I don’t know why it works like that, but it does. I’ve talked to others who have had similar experiences. Sometimes facing your own mortality can make you scared and twisted up and angry and bitter. But sometimes it can open you up to new depths of love and caring about others, that you didn’t know were possible. And even if you start out scared or angry or bitter, it’s possible to change bit by bit, more and more towards enacting that love in the real world. I firmly believe that if people were more willing to face our collective fragility, vulnerability, mortality, and death, then we would be less ableist. All of us, disabled and nondisabled. I’m going to end with a video taken shortly before the death of Eva Markvoort, a young woman who had cystic fibrosis, got a lung transplant, and ultimately died of chronic rejection. I’m posting the video because she so clearly allowed her impending death to open her up to all of the love that the world has to offer. This wasn’t easy for her, it didn’t just magically happen, and it’s not meant to be an inspirational cripple story, which I’m sure she’d have hated — one of those things where we exist only to teach a lesson to the nondisabled world, when we are so much more than a lesson. Yet I hope that we can all face our deaths as well as she did in the end. At least, I hope that I can. When I look at her in this video, I see in my head that invisible solid light that I see whenever I or someone else is sufficiently close to death — it’s all around her, it’s coming through her, and it’s allowing amazing, beautiful things to happen to her and those around her in her last hours. When I sit outside on the ferry is when I most believe in love. I don’t know why. Something about the wind makes me feel alive…the seagulls and the sky…whether its sunny and bright or cloudy and grey or nighttime and I’m surrounded by vast darkness…I just feel…FULL. Full of love and energy….almost as though I’m porous and the wind soars through tiny holes in my body and I’m part of it all…the earth and the people and the relation of everything with everything…as though I don’t matter…but its not scary…its wonderful….i feel so free. It’s the only time I’m not afraid to die. Cuz I can feel the wind and I know that I’ll always be a part of life…and the love and energy that are contained in my skin will be let loose into the wind and the world will just know how much I care and love and I will live forever. I believe that love is what defines us as human. I believe that my love for you will never die. My heart breaks to think of how lucky I am. How happy and hopeful and full I am. I love you so solidly. I am real and you are real and I hope we will always be real. I am in awe of you. My interest in who you are is infinite. Drop a stone in the well of my desire for you and you’ll never hear it hit the bottom. You amaze me. Your love makes me invincible…no not invincible…immortal. Because when I die I believe my love for you will surround you till your soul joins mine in the wind. I hope that the world can learn to overcome the terror they associate with fragility, imperfection, vulnerability, and mortality, the terror that currently makes so many people fear and hate disabled people (and, in turn, drive us closer to an untimely death). I hope that the world can stop fearing death, and stop fearing the disability and sickness that reminds them of death. I hope that people will understand my meaning here, and not use it to justify the deaths of disabled and chronically ill people who need all the help we can get to survive already. I hope that the world can learn to love — in the active, difficult, demanding way that deep love entails — and that this can further all of the above. Because active love and compassion, caring about each other on every level possible, is the only thing that digs deep enough to create lasting change. And love is the only thing that can end fear or hatred.